CE/DP Stealer, the original tool for stealing Messenger Display Pictures, Emoticons and more from your contacts has been updated to version 6.0! The Stealer works with all versions of MSN and Live Messenger (including 8.5)! Download CE/DP Stealer to start robbing your Messenger contacts! Find out what's new in this brand new version! MSN Display Pictures: New Year 2007 MSN Display Pictures, Avatars and Icons! With 2006 rapidly coming to a close, 2007 awaits right around the corner. You can ring in the new year with a free set of New Years Display Pictures. MSN Display Pictures: Christmas MSN Display Pictures and MSN Icons, free MSN Display Pics! With the holiday spirit (and specials) in full-blast, Christmas is quickly descending upon us! This year, we've brought you another great Christmas special. So go ahead and deck your Messenger with these Christmas MSN Display Pictures, Avatars and MSN Icons! With the scariest night of the year, Halloween, arriving shortly - it's time to break out the Messenger goodies! This year, we've got a fresh pack of awesome Halloween Display Pictures, Emoticons and Icons ready to be installed into Messenger! MSN Display Pictures: CE/DP Stealer 5.0 - updated Stealer for MSN and Windows Live Messenger! The CE/DP Stealer was recently updated to include compatibility with the new Windows Live Messenger! 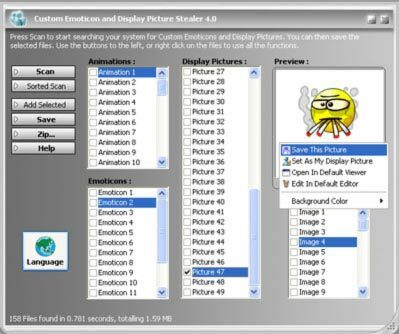 For new users, the CE/DP Stealer allows you to steal graphics such as MSN Display Pics and Emoticons from your contacts on MSN Messenger and Windows Live Messenger. To read more about the Stealer, click here. This version of the Stealer also features an updated help file and several other small bug fixes. Download CE/DP Stealer 5.0 and rob your MSN Messenger and Live Messenger friends! MSN Display Pictures: MSN Icon and Display Picture maker: create Icons, Avatars, MSN Dollz & pics! Have you ever wanted to create your very own totally customized MSN Icons and Avatars? Introducing Zwinkys, a brand new website that allows you to create your own custom characters and lots more! You can create your own characters and make them come to life by selecting all of their features (like eyes, hair, nose, etc) and then choosing from loads of clothes and accessories. You can also choose your avatar's background, including some animated ones. Once done with the avatar maker, you could import your new avatar into MSN Messenger or Live Messenger as your Display Picture. Just click the banner above to instantly start making your own MSN Icons and Avatars! With Football Fever (maybe you call it Soccer?) sweeping the globe as the 2006 FIFA World Cup kicks off, we've created a brand-new online tool to create your own soccer/football MSN Display Pictures, Icons or Yahoo Avatars. Go Create Your Own Football Display Picture! Here is a brand new set of awesome 3D Display Pics and Icons for MSN Messenger! All of the Display Pictures in this set are designed in 3D and look great. You can use these impressive new MSN Display Pics to bring your Messenger conversations to life! A new set of Mood MSN Display Pics has been added to the MSN Display Pictures collection! 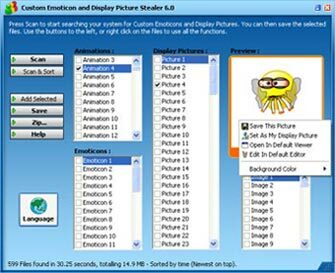 These expressive display pics for MSN Messenger are automatically installed into your MSN Messenger (MSN 7.5, 8.0, etc) using the simple installer. You can also get more free MSN Icons, Display Pics and MSN Avatars from here. Stay tuned for lots more MSN Pics, Icons and Display Pictures! A set of Grand Theft Auto: San Andreas MSN Display Pictures has now been added to our recently revamped MSN Display Pictures section! You can now bring the latest and greatest GTA game to life, within MSN Messenger! This free display picture set has pics from the game, featuring all of the characters and much more as msn display pictures! Need more MSN Display Pictures? We have totally revamped our MSN Display Pictures pages. All of the available MSN Display Pics are now categorized! Just go to the MSN Display Pictures page and choose from the list of available categories. You will then see a list of the available MSN Display Pics in that category. Other items such as the MSN Display Pictures Help and Customized Display Pictures have also been sorted, with a lot more to come very shortly! CE/DP Stealer, the original MSN Messenger content stealer has been updated to version 4.0! With the CE/DP Stealer, you can steal MSN Emoticons, MSN Display Pictures, MSN Icons and more from your contacts on MSN Messenger 6/7. Most importantly, this version introduces Multilingual support and initially supports: English, Dutch, Spanish, French, German, Italian, Portuguese (Brasil & Portugal) and Swedish. CE/DP Stealer can steal content from MSN Messenger 6 and 7, provides built in previewing of all images (including animated MSN icons and smileys) and you can easily save the pictures and MSN Icons using the built in functionality. You could even add the images to a Zip archive or add them directly to your MSN Messenger! For more details and information visit the CE/DP Stealer 4 section. The Love Display Pictures collection for MSN Messenger is a compilation of cheery, love related display pics. The perfect download for adding that special effect to your romance! The Love Initials MSN Display Pictures set is a compilation of display pictures that can be used to represent the initials of your loved ones in MSN Messenger this Valentine's Day. All of the letters of the alphabet (english) are included, perfect for showing that special someone that you care on MSN Messenger! Compatible with MSN 7 (and MSN Messenger 6). Love MSN Display Picture creator allows you to easily and instantly create your very customized, love related MSN Messenger Display Pictures. There are four different types of display pictures to customize such as names and initials in hearts, or you can add your very own special messages to the templates. Other customizations include optional extra graphics and text formatting. Created display pictures can be immediately imported directly into MSN Messenger, so you can have your very own, customized, romantic display picture in seconds!